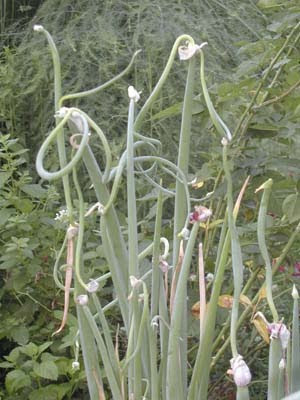 As a gardener who is attempting to grow some of our own foods, when it comes to onions I am a complete failure. I have yet to grow an onion that has an edible bulb. (I did great with garlic) But I seem to have mastered onions as abstract art! This image shows the beginnings of just how whacky those guys can get. I swear they are dancing and singing there way through the season. I am quite sure I was supposed to do somethng before they got to this state. That was weeks ago. Now there are bulbettes where all those higgledy piggledy stems originate from the main stems. I just know that this is the inspiration for my next quilt. BTW- I did finish my last piece "Celebrating Normalcy" and depending on what happens with the show I just entered it into, I'll post images later. FYI-- there are some shows where they will not accept pieces that have shown up on websites- period. So to leave that option open I'll be keeping the finished image to myself for now. And yes-- they DO check.